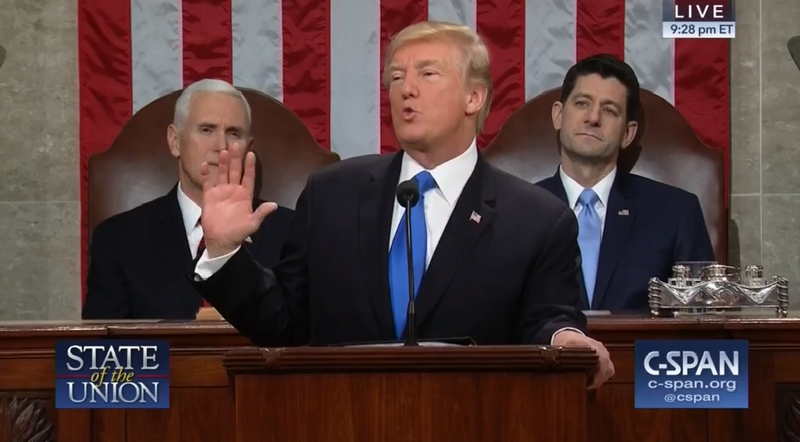 (Image Courtesy of CSPAN) President Trump have his remarks to Congress at the 2018 State of the Union. On January 30, President Donald J. Trump addressed Congress in a special joint session of Congress known as the State of the Union. After watching his speech for an hour, I also viewed the official Democratic response from Rep. Joe Kennedy III. However, similar to his speech’s stance on immigration, his call for compromise and unity was all undermined by the rhetoric he used, which seemed to tout the accomplishments which divided Americans. Shifting more towards criticism, I would have to say that as a Salvadoran, I was deeply saddened to see a sitting president talk about immigration in terms of Dreamers and MS-13. The way which he presented immigration was controversial for his version of compromise seems to many as another victory for the Republican party. As he applauded (very loudly, if I may add) to the elimination of the individual mandate and the passing of the tax reform legislation Congress barely managed to pass, he received no approval from the other side of the aisle. The Democrat’s decision to stay seated was their response to POTUS’ message and by doing so, Trump’s provocative jabs at Democrats quickly showed that he does not exactly practice what he preaches. Unity in a speech sounds nice. Actual strives towards unity are another thing. Attempts at unity at a bipartisan meeting look ugly because the reality of the situation is that compromise is difficult. When there are fundamental issues at stake, raised by both sides, it means no party wins. Compromise, however, means Americans have a chance to win and it also is a healthy indicator of a democracy in practice. His speech, however, comes at odds with the government shutdown we recently had. No compromise was made there. Instead, division grew. What Trump sowed in America with his speech were bitter seeds of division. Rep. Joe Kennedy III briefly dived into this. America is currently being offered a false dichotomy by the Trump administration and by Paul Ryan’s agenda. To them, it is either Dreamers or CHIP. It is either long-term tax benefits for the rich or no tax bill at all. It is either slashing Medicare and Medicaid or increasing the national debt. It is time to reject this. In the land of the free, no family should need to decide whether they want to put food on the table or pay for their prescriptions. Regardless of where we stand on the political spectrum, we all cannot deny that the divide has been getting worse. Political polarization is at an all-time high while political party affiliation is on the decline. This has brewed a rather unusually complex distrust of government. But, we must do better. Let us hope that if there’s one thing America takes away from Trump’s speech, that it will be his theme of unity. It does not necessarily have to be a consensus on everything, but rather an agreement to disagree. I believe this is a good time to remind ourselves that this is not the end of an era nor of America. Even if this is the end of an era, in our end, is our beginning. If we hold on to hope, America will surely continue to be a ‘city upon a hill.’ And maybe our contribution to our country can be as small as hoping. Because as long as there is hope on either side of the aisle, we have a country worth fighting for. To watch a video of POTUS’ State of the Union speech, visit this link.